What native wildflower seeds do best in black clay soil? We live in Plano along creek w/ 8,000 sq. ft. in full sun. No manmade water source. Suggestions? This is going to sound a little flip, but looking around and seeing what wildflowers are already blooming there would be a good start. We advocate the use of plants native to an area because you already know they will grow in the area. However, maybe you didn't have a chance to observe what was blooming around your area before now, and now is when you should be seeding. The Cross Timbers and Prairies area in North Central Texas includes the Cross Timbers, Grand Prairie, and North Central Prairies land resource areas. This area represents the southern extension of the Central Lowlands and the western extreme of the Coastal Plains. The wide variances in geologic formations bring about sharp contrasts in topography, soils, and vegetation. Upland soils of both the East and West Cross Timbers are light, slightly acid loamy sands and sandy loams with yellowish brown to red clayey subsoils. Bottomland soils have small, dark, neutral to calcareous clayey areas, and loamy alluvial soils occur along the minor streams. Upland soils are dark, deep to shallow, and stony calcareous clays with subsoils of lighter, limy earths and limestone fragments. Bottomland soils are reddish brown, loamy to clayey calcareous alluvial. The North Central Prairies are interspersed with rapidly drained sandstone and shaley ridges and hills occupied by scrub live oak, juniper, and mesquite. Uplands are brown, sandy loam to silt loam, slightly acid soils over red to gray, neutral to alkaline clayey subsoils. Bottomland soils are brown to dark gray, loamy and clayey, neutral to calcareous, and alluvial." 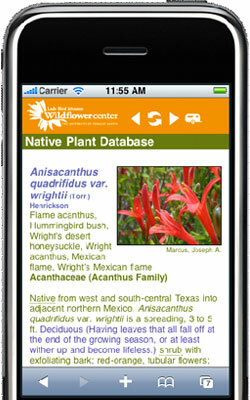 You can see that there is a whole lot of variety, but the plants on the lists are all in our Native Plant Database, so the webpages can be checked to see what soils each plant does best in. Since they are in our database, we can take the selected list and search on it just as we would in the database. We will search, selecting on "herbs and forbs" (herbaceous blooming plants) under Habit and then, from that list hand pick some plants we consider wildflowers, go to the webpage and check under growing conditions. If you want to narrow the search down more you could designate the amount of sunlight, maybe even color and blooming time you want, but be careful - if you get too specific, you might find yourself with no selections to choose from. We will try to make a trial list for you, even checking each plant on the USDA Plant Profile Map to see if it grows natively in Collin County. Once you have gone through that drill, you should be in a position to take the same route and find plants you prefer. When we ran that search, we got 71 results. We chose some we consider good Texas wildflowers. All that we ultimately chose had either "clay" or "clay loam" listed as an appropriate soil and all grow in or near Collin County, TX. When you are making choices be sure to read all of the webpage to match growing conditions to those on your property. May 11, 2013 - What can be used as an annual flowering plant to substitute for the diseased impatiens? Is Vinca one you would suggest?